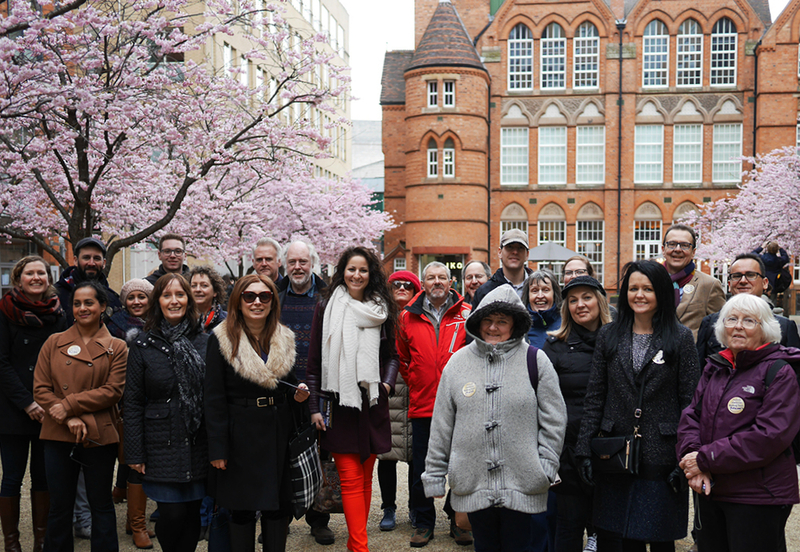 The group's latest gathering, on Saturday 18 March 2017, was a guided tour of central Birmingham, organised through Positively Birmingham. Some two dozen people gathered outside the Central Library for the tour, the vast majority of whom were Midlands group members and their friends and families. Among the rest, incidentally, were visitors from Canada and Germany, come to find out about the city. The tour organiser and guide, Jonathan Berg, was friendly and informative. The city centre has been knocked down and re-built a number of times – the famed brutalist 70's predecessor to the current library is yet another hole in the ground among many undergoing redevelopment. Thus there is little in the way of old architecture to see - little Georgian or Victorian architecture and no quaint half-timbered Tudor buildings except in some of the southern suburbs. The tour was centred round the International Conference Centre, Brindley Place and the canal, with the Gas Street Basin, illustrating the renewal of the canal network. The talk concentrated on the developments in that part of the city which contributed to its growth from an unimportant village to the second largest city in the country. Some of the group met for lunch beforehand in one of the few remaining Victorian pubs and then we returned there for a drink afterwards to slake thirsts created by an hour and three quarters of walking and standing. The whole made for an enjoyable afternoon during which more new acquaintances were made. This is a guided walking tour of central Birmingham. Tours are organised by Positively Birmingham. The tour lasts approx 1hr45m starting at the Birmingham Library. Each participant gets a free copy of the book Positively Birmingham on which the tour is loosely based. The group will go for a drink at The Shakespeare on Summer Row immediately after the walking tour. The tours are organised by Positively Birmingham. Book online individually via the organisers' booking page. The cost is £9.60 per head. Please let us know once you've booked via midlands@ciol.org.uk. We look forward to meeting up with many of you for this interesting and social outing. The event organisers will put on more than one guide if numbers are large but no maximum is stated. No cut off date for bookings given.